Keywords: Albendazole, Albendazole Sulphoxide, Albendazole Sulphone, Praziquantel, HPLC–UV, Column Switch. Keywords:Albendazole, Albendazole Sulphoxide, Albendazole Sulphone, Praziquantel, HPLC–UV, Column Switch. Abstract:Background: In order to combat neurocysticercosis, effective and novel Fixed Dose Drug Combinations (FDC) of combination dosage regimens have been always under trial; with Albendazole (ABZ) and Praziquantel (PZQ) combination being one of them. 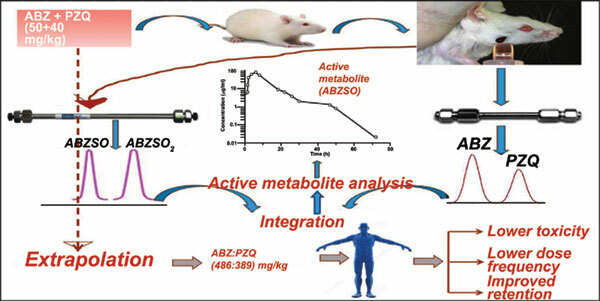 Such outcome is basically dependent on the pharmacokinetic profiling of their metabolites such as Albendazole Sulphoxide (ABZSO, active), Albendazole Sulphone (ABZSO2, inactive) and PZQ-TRANS; followed by their back extrapolations to suggest a safe, however potent dosage regimen.